This was the first song that came to mind when I thought about doing a week of duets. To me, it’s the quintessential meeting of two artists who elevate each other’s game in a way that nobody could have predicted. 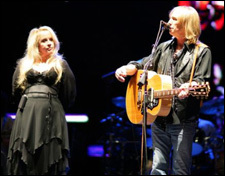 Nicks and Petty have sung several songs together, though this is by far the most famous. Written by Petty and Heartbreaker Mike Campbell, it appeared on Stevie Nicks’ first solo album and hasn’t left radio rotation since. I mean, I never listen to the radio, and I’ve still heard this song a hundred times without owning it. Stevie Nicks has one of the great pop voices, while Tom Petty’s nasally whine is definitely an acquired taste. But here, it’s a peanut butter and chocolate mix that’s 80s pop perfection. This entry was posted in song of the day and tagged Stevie Nicks, Stop Draggin' My Heart Around, Tom Petty. While I appreciate Stevie Nicks as much as the next guy, I find it hard to swallow the notion that she elevates Tom Petty’s game. I do, however, enjoy the way their voices sound together in this duet staple, that I, too, have heard a hundred times despite not owning it. By the way, your selection today reminds me that Petty is also capable of writing and delivering a song (not this one) that is both comical and straightforward musically speaking. So I’d add him to yesterday’s list. and Ben Folds also should be added to the list serious artists who can put comedy into song. Funny you should pick this song, as I just heard Dave Stewart being interviewed on Stern and he was talking about how he briefly “dated” Nicks around the time of this song. Apparently, as the story goes, he hooked up with Stevie shortly after she ended a relationship with Joe Walsh and, one day while he was over at Stevie’s, Walsh came over unexpectedly and it created quite the hostile scene–leading to Stewart’s inspriation for “Don’t Come Around Here No Mare” recorded by Petty. Also, apparently the fairly common amount of hallucinagenic drugs being taken by all involved at the time of the confrontation inspired the Alice in Wonderland video for the song. That’s interesting. I always thought Petty wrote ‘Don’t Come Around Here No More’ (looks like he cowrote it, according to AllMusic). I didn’t realize Dave Stewart produced Southern Accents, either. That’s definitely one of my favorite Petty albums. Funny how all those 70s bands were so incestuous. Stevie Nicks must have slept with every rocker in the business. Well that’s a fair assumption to make. Well, her name always turns up in these stories of debauchery!